I know you have all been wondering about this, so I thought it was important to share… 🙂 During the 1920s, 130 Staten Islanders had licenses to keep goats. Yes, you needed a license to own a goat at this time. It was common to see goats in Rosebank, Old Place, at Lambert’s Lane and around Chelsea. On the south shore goats were a problem for the railroad as the belligerent livestock often stood on the tracks and halted trains. Conductors had to get off the trains and manually remove the goats themselves. 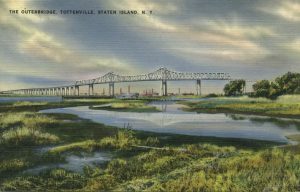 Outerbridge Crossing, postcard, circa late 1930’s. Banner headline from May 1, 1925. Staten Island was experiencing a real estate boom in the 1920’s. Countless dollars were spent on advertising, especially in the Manhattan and Staten Island newspapers. The Staten Island Advance, the Staten Island Leader, the New York Herald, the New York Tribune and the New York Times would take in millions. According to historian Charles Sachs one real estate broker speculated “Staten Island’s growth is yet to come—it is New York City’s future Bronx.” Of course, this proclamation was off by forty years, but the population did grow from 67,021 in 1910 to 158,346 in 1930!